A Sheffield-based opticians practice has been named as the city’s most active workplace as part of a challenge to get businesses on their feet. Alex Gage Optometrist achieved the most active minutes as part of Move More Month’s Workplace Challenge, which saw more than 100 workplaces, 420 teams and 2,500 participants battle it out to reach the top spot. The team, made up of five members of staff, clocked up a total of 52,132 minutes between them – which means on average each person moved for 334 minutes each day. The Workplace Challenge is a web-based team activity competition for organisations and their employees. It used the specially designed Move More app, or pedometers and other popular apps to monitor employee movement. The results were then displayed on a website, where participation medals were awarded and teams compared their efforts with others in a Move More League table. Alex Gage said: “We are delighted to have won the Workplace Challenge this year – it’s been a very active month for all of us. “At Alex Gage Optometrist, we were determined to get active for the workplace challenge so we all did a lot of walking in the evenings – four of us had Fitbits and were already quite competitive with steps! “To get my active minutes up, I made small changes like parking my car a few streets away from the practice so I could get in a few more steps along the way. The second most active organisation was B Braun who clocked up an average of 265 minutes per day, followed by South Yorkshire Housing with 218 average minutes a day. Other winners on the night included Tracy Granger, from Hand Harriers (Sheffield Teaching Hospitals), who clocked up an impressive 16,679 active minutes across the month. The most improved team went to the hip fracture FLOW team at Sheffield Teaching Hospitals who clocked up 163 average active minutes in week 1 and an average of 258 minutes on week 4, meaning an improvement of 94 minutes per day. Professor Robert Copeland, director for the NCSEM and Move More, said: “I’d like to say a huge well done to the Alex Gage team for such impressive totals! They really have gone above and beyond to ‘Move More’ during June. “The fact that more than 100 businesses got involved in the challenge has exceeded all our expectations. To know that so many people have not only supported the initiative, but completely embraced it has been so fantastic to see. It’s all about friendly competition between colleagues, businesses and organisations across Sheffield with the aim to encourage everyone to Move More. “When asked, 57 per cent of the challenge players reported not to be hitting government guidelines for physical activity at the beginning of the competition. We all know that in the workplace it is easy to spend the entire day at your desk but this challenge has shown that, with a conscious effort, it is actually very easy to make the changes needed to stay active. “It’s about going out for a walk on your lunch break, walking to a meeting instead of taking the car and even teaming up with your colleagues for after work gym sessions. It is these things that can make a huge impact on a person’s overall health and wellbeing. Yorkshire Cancer Research was the official partner of the challenge. 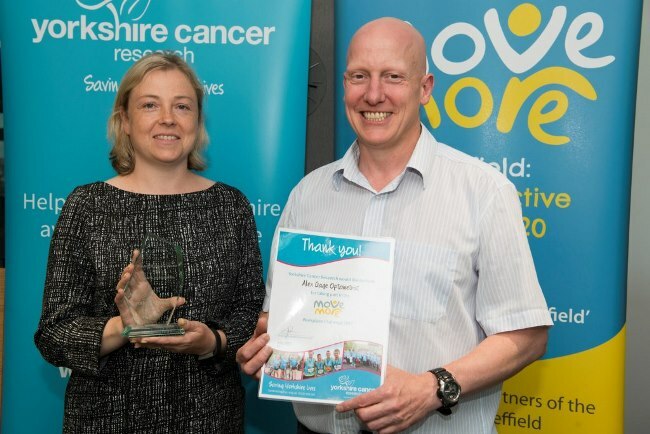 The charity supported the initiative with a £50,000 investment as part of its new strategy to reduce the risk of cancer by encouraging healthy lifestyles. Four in 10 cases of cancer could be prevented through lifestyle changes, such as not smoking, eating well, drinking less alcohol, being active and staying safe in the sun. Move More Month is a unique physical activity programme with the aim of getting thousands of people on the move across Sheffield. Created by the National Centre for Sport and Exercise Medicine (NCSEM), Move More Month encouraged the people of Sheffield to get active and to record their physical activity during June to see how many combined minutes the city can record. Move More Month saw activities and initiatives held across the city, aiming to get people involved and generate a sense of city cohesion.